Well, this post is just a little late considering baby Sean will be two in a few months! The light in his room always looks odd in photographs so I think I kept hoping someday I would get better pictures. I finally decided I needed to post this before he is out of his crib, hopefully I still have quite a while! Sean's nursery used to be Will's big boy bed. We bought him the white bed at ikea and he slept in it for about a week when he was nearly three years old. Unfortunately, that week was the fourth of July and between the fireworks and a few very loud summer storms, he started freaking out at bedtime. The easy solution turned out to be that he felt completely secure in his brother Jack's room. They have shared a room since. I didn't want to spend a lot of money on the nursery, since he was the third and most likely, last, child. However, I was not excited to use the gender neutral baby room things from the last two again. So we had a bed with a green comforter and a yellow upholstered rocking chair. I convinced Andrew that I had to recover that rocking chair and I found a lovely remnant of gray matelasse fabric marked down from $40 to $7 a yard, so that sealed the deal. Luckily, the adorable Fox Hollow fabric line from monaluna organics worked perfectly with the odd green comforter (which I can't wait to replace with a fancy foxes quilt). Other than that I made everything or found steals at target. Seeing these pictures makes me wish I had just gone ahead and painted the walls. That beige drives me crazy. When you walk into the nursery, the changing table and bed are on the left. I found the basket with the red sweater knit lining at target on mega clearance after Christmas before Sean was born. I made the center pillow from the Fox Hollow cheater print fabric and bought the fox pillow from Maureen Cracknell. The frames are from Ikea and I bought the prints on Etsy, but I can't remember which seller. 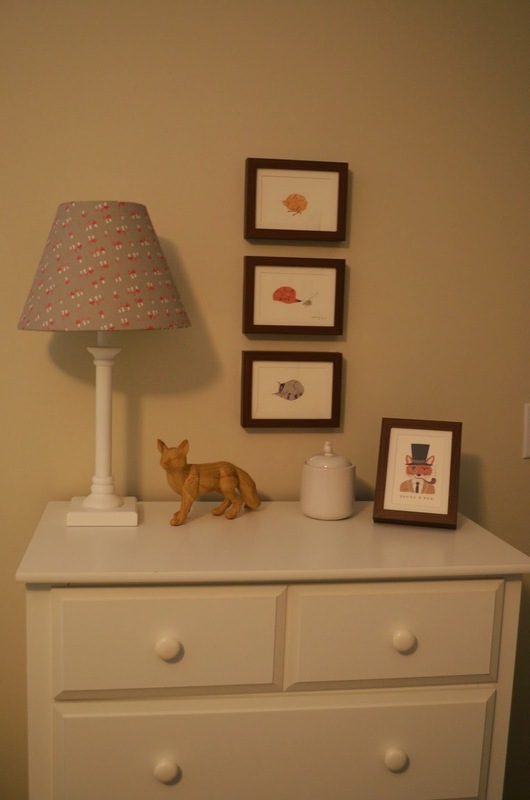 Above the changing table I have a little ledge with Heather Ross prints, a red fox snow globe (again target after-Christmas clearance) and some nesting animal dolls. I made the "SEAN" banner in Fox Hollow fabric. Straight ahead is this little dresser. This is one of my favorite spots in the nursery. The wooden fox was from target, as well as the ceramic canister with an owl on the lid. I recovered the lampshade with the mushroom print from Fox Hollow and the trio of framed prints are from Heather Ross' warehouse sale a few years ago. The "You're a Fox" print is actually a greeting card. Continuing to the other wall of his room, we have the chair and crib. This part of the room drives me crazy. Really, we just had too much furniture for this room, but we knew we would need the bed eventually and where do you put a bed for a few years while you don't need it? The attic seems kind of yucky to store a mattress and our pull down steps would have made it difficult to get it all up. I made the crib sheet, the pillow cover and blanket from more Fox Hollow fabric. 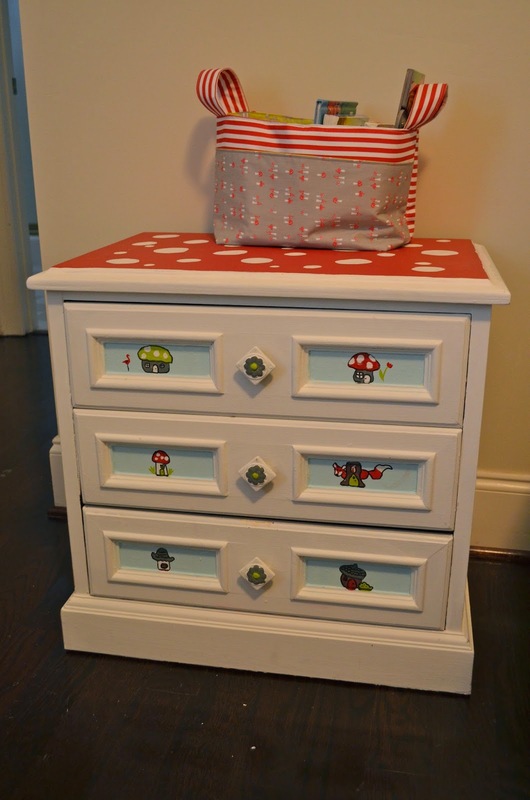 I had a lot of fun painting this nighstand with a toad stool top and little mushroom houses. I made a noodlehead divided basket to hold books and tissues. 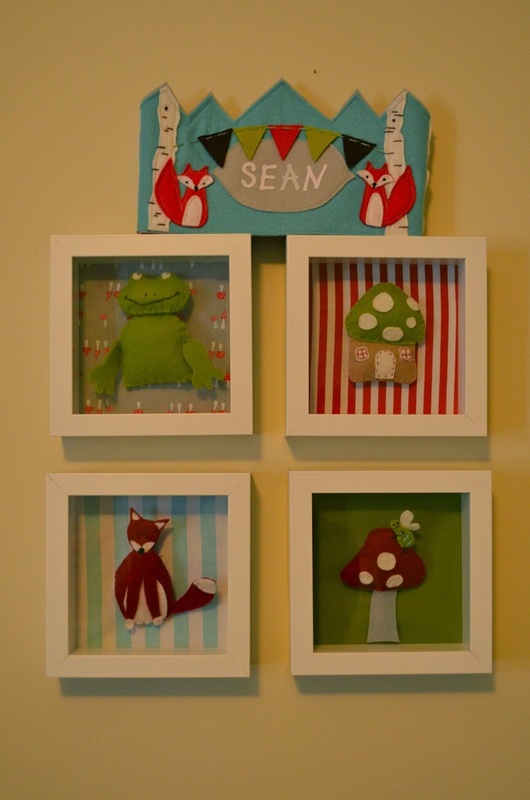 Above the nightstand I made these little felt critters and mushrooms to go in some shadowbox frames from ikea. The birthday crown was also purchased from Maureen Cracknell. This little shadowbox (tutorial in this post) hangs by the door and we have fun switching the pictures out occasionally. Sean says, "thanks for taking a tour of my room!" Lucky Sean! I love the things you've made AND purchased!